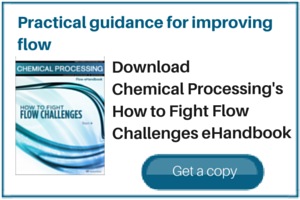 Poor flow is one of the most common problems encountered in handling or storing solids. With liquids you open the valve and (hopefully) material runs out. With solids you often have to pray before opening the valve. Wouldn’t it be nice to have an inexpensive well-established test method or procedure that would allow you to predict whether a fine powder will flow after a given time interval? Often test methods take too long and generate results that are qualitative and very subjective. Also, material may be limited and quantitative test procedures are very expensive. If your plant has been working with solids you’re probably familiar with this scenario. The basic issue is a balance of cost versus usable results. Clumping is a complicated issue that’s difficult to quantify; so it’s no surprise that finding a meaningful test is difficult. In most cases, clumping is unpredictable. However, a generalized procedure can be used to solve a clumping problem after it has occurred. By clumping we really mean unintended agglomeration. While some types of agglomeration are desirable, e.g., to reduce dustiness or make a material easier to handle, most clumping isn’t appreciated. The last thing you need in a pharmaceutical plant is for a bulk bag of acetaminophen to come in as a solid block (as has happened). Clumping is such a tricky issue due to its many causes. Before you can select a test method or procedure, you need to determine the root cause of clumping. Sometimes that can identify a solution without further testing. 1. Free or surface. These are easily removed by drying. However, in a production facility time may be limited or heat not uniformly distributed to solids. Most dryers are run based on contact time or exit temperature. While a longer time will give a dryer product that extra time may alter product color, taste or effectiveness. 2. Bound. Cohesive or electrostatic forces can cause physical or chemical adsorption of solvent onto particles. Some types of dryers are better at removing bound solvent but this can a difficult source to quantify. 3. Inherent. Solvent molecules trapped inside crevices of crystals or micropores of amorphous powders come into play when particles break. These molecules usually can’t be removed by drying but you can minimize their effect, especially after a milling process. Solvents of hydration or crystallization are part of this group — but they’re a stable form of the chemical that only would be released by a phase change or chemical reaction. 4. Interstitial. Vapor that fills voids in bulk material may total only a very small amount of solvent but can play an important role in caking mechanisms. When this source is identified as part of the problem it’s fairly easy to fix by purging or fluidizing with dry gas. Total solvent is the sum of all of the above. 8. DSC — for heat flow with time (which is especially useful in multi-component solvent systems). 1. Simple dissolution followed by drying of solids without any chemical reaction. This is the fundamental problem with a lot of storage systems. Bags aren’t sealed well enough or a solvent gets into the transport line. Several of the following causes also involve this process but in a roundabout way. 2. Chemical reaction between particles and gases in voids in the bulk solid. Most common is formation of hydrates, which changes particle density or creates bridges between particles. Oxidation or reduction of particles is less common but can release gases or yield condensable products that form a sticky film on the solids. Diffusion of soluble gases such as carbon dioxide can soften particles and make them susceptible to shear. In addition, particles can interact with wall material through abrasion, which can act as a catalyst to reduce the potential energy needed for a reaction to occur. 3. Change of phase. This is the most difficult problem to diagnose but often is easiest to prevent. Many people don’t realize that a polymorph could be present. About one-third of all organics have at least one polymorph ; lots of pharmaceuticals rely on chemicals that aren’t in their most stable form. While transformation upon storage may take years a small amount of change can result in a big effect on flowability. For crystalline solids the problem usually starts with a very small amount of excess solvent and a temperature change. The unstable form dissolves and then recrystallizes into the stable form with solvent release. The process will repeat as solvent moves from particle to particle. A similar process can occur with amorphous organics because the crystalline form is at a lower potential energy. 4. Recrystallization of solids during storage. Often particles can pick up excess energy prior to storage though handling or milling operations. The latter is a very common culprit because attrition raises the surface potential energy of the solids and creates very fine solids, which have a much higher charge-to-mass ratio. It’s rare for solid-state transformation to occur but it only takes a small amount of solvent to aid the crystallization process, similar to a polymorphic transformation. 5. Viscous films on particles. Interstitial solvent can prompt formation of such films. Heating or cooling solids can cause solvent to migrate and collect in one location. As the solvent partially evaporates, it leaves behind a sticky surface on the particle that can lead to bridging. 6. Impurities in solids. These can induce stresses in the particles, which can hasten chemical reaction, phase changes and recrystallization. Impurities can act as catalysts in a reaction or interact with wall materials to initiate one of the causes previously cited. Localized change in density due to an impurity can prevent normal transfer of shear force from particle to particle and put more stress on an individual particle, resulting in breakage. Location of the impurity — whether on the surface or interior of the particle — may even be critical and cause some batches of solids to behave much differently than others. 7. Particle size and width of the particle size distribution (PSD). These attributes often can’t be changed but contribute to clumping. Finer particles have higher specific surface area and more particle/particle contact, resulting in higher shear forces. In addition, the van der Waals’ forces increase rapidly with finer particles. The wider the PSD, the more likely voids around larger particles will fill in with fine particles and boost cohesion. While this is a major factor in clumping, it’s very easy to identify in advance of a problem. 8. Attrition. This is more of a contributing factor for the previously mentioned sources of clumping. Breakage of particles releases energy that’s confined to the solids’ surface. In addition, finer solids will have poorer flowability and higher electrostatic charge. The increase in fines makes the PSD wider and solids easier to bridge. 9. Mechanical deformation of solids. This usually isn’t the primary cause of agglomeration. The normal stresses in a bulk bag or fiber drum are fairly low. However, the ultimate formation of agglomerates often appears as a mechanical failure. Because a solid is defined as something that can support its own weight, most failures stem from shear forces that exceed the solid’s strength. Many of the previous sources of clumping induce a failure that allows for compression of solids to form agglomerate. 10. Vibration. This often is overlooked as a cause of finer solids sifting into voids and increasing compression of bulk solids. When combined with temperature changes, vibration can make solids soften or plasticize, resulting in physical deformation and clumping. However, sometimes vibration can help to prevent mechanical deformation during transport. As the above highlights, one major factor that repeatedly enters the equation is the presence of excess solvent or solvent vapor. If either afflicts solids, you must focus attention on the solvent source. Water is the most common solvent; moisture causes many clumping problems reported in the chemical and pharmaceutical industries. Four major types of solvent in bulk solids contribute to clumping (see sidebar). No single test can detect all four; methods for determining the amount of solvent may not give a clear indication of the type. Chemical Processing has published many articles on ways to test the strength of bulk solids and how they gain strength on storage. The majority of these tests focus on setting parameters for design of a bin or chute to keep product moving or to induce flow. Clumping is an afterthought of these methods. The tests can show how a material gains strength upon storage but can’t predict outside of testing conditions (time or temperature) future increase in strength. In many cases the rise may be limited, at least to a solid block of solids. In addition, most methods require specialized and costly equipment, which is the major reason plants don’t conduct such tests prior to experiencing a problem. However, these tests, by determining the time-dependent unconfined yield strength, are some of the best ways to determine when there’ll be a problem. The three major contenders for test equipment for this property are the Schultze (ASTM D6773) and Jenike (ASTM D6128) shear cells and the Johanson Indicizer. In addition, other devices have been developed for specialized industries, such as the Humboldt Tri-axial Tester for geotechnical assessment. Some of these methods can use samples as small as 20 g — but several runs may be needed to account for product variability. These tests’ major limitation is that, to be assured that material won’t exceed a given strength in the future, trials must cover a wide range of temperature and humidity over the expected storage time. This may not be practical for solids kept in a bag or drum for many months and for replicating shipping conditions. Carr [2-4] developed several tests in an attempt to determine the flowability and compressibility of bulk solids. His methods give indices that have had mixed reviews over the last 40 years. Many companies have devised their own internal methods and have published these for others to use — but they’re often subjective and depend on the operator’s scrutiny. Examples are observation of flow though different orifice sizes, lumping and compression as well as frangibility and friability tests. • Frangibility (sometimes called friability) tests — indicate relative strength of agglomerates, can be used to estimate crushing strength or how easily a clump can be broken, which may eliminate the need to solve a clumping problem, but use non-standard equipment (large balls are placed on the upper screen of a sieve stack and vibrated; amount of solids that pass to the pan is compared to the amount that goes to the pan without the balls). • Atomic force microscopy— can observe real-time agglomeration (this technique is evolving rapidly and eventually may be able to see atomic-level changes). Is it possible to predict cohesion? Probably not. No one test is appropriate but many qualitative tests can help define the potential. So, what do you do to minimize clumping? The solution to many prospective causes of clumping centers on minimizing solvent contact with solids, controlling particle size, limiting attrition sources and avoiding putting excess energy into solids, especially prior to packaging. Table 2 gives some specific suggestions for the ten common causes of clumping. For each there’s often a first line of defense. However, many of the solutions can treat other related causes. For example, filling a drum from an excessive height can increase attrition, mechanical deformation and solvent vapor trapped (by boosting the amount of voids). Also, packaging a hot material can promote chemical reaction, phase change, recrystallization and formation of viscous films. As a last resort you can modify solids through agglomeration or addition of flow aids such as silica. But that’s another subject. Tom Blackwood is director of technology for Healthsite Associates, St. Louis. E-mail him at trblac@att.net. 1. Blackwood, T., “Don’t let Phase Changes Faze You,” Chem. Proc., October 2005, p. 31, www.ChemicalProcessing.com/articles/2005/559.html. 2. Carr, R. L., Jr. “Evaluating Flow Properties of Solids,” Chem. Eng., p. 163 (Jan. 18, 1965). 3. Carr, R. L., Jr., “Classifying Flow Properties of Solids,” Chem. Eng., p. 69 (Feb. 1, 1965). 4. Carr, R. L., Jr., “Particle Behavior, Storage and Flow,” Publ. 68-MH-6, ASME, New York (Oct. 1968). 5. “Standard Test Method for Bulk Solids Characterization by Carr Indices,” Standard D6393-99, ASTM Intl., West Conshohocken, Pa. (1999). 6. “Comparison of Physical Property Traits of Niacin and Niacinamide,” Tech. Bulletin TPU-0402, BASF Corp., Florham Park, N. J. (2004). Sophisticated analyses can provide insights to curb caking and improve processing. Energy efficiency and other pluses boost mechanical movement.